We met for our day retreat in the Friends Meeting House building which is very close to Manchester Town Hall. As each hour arrived the booming out of the Town Hall clock left us in no doubt to the passing of time. So loud, so very loud that at first we all thought something bad was happening out there in the streets of good old Manchester. Window rattling chimes. Then today news of a tornado, or many mini tornadoes in England. 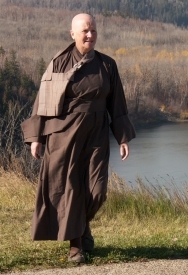 One of our monks reported her experience of being in a house when one passed by. One moment calm the next car alarms going off, glass breaking, curtains sucked out through an open window. Moments later a return to calm and the wreckage strewn on the street. The house will need to be re roofed. Window rattling weather, and then some! Above is a comment left on the posting Wind and Rain. Copied here because of the connection with this posting, and the connection to practice. That’s the fast changing ‘weather’ of practice, which one can become so very easily shaken by. Or rattled! My sitting place is starting to feel like sheltered stupa described here. The effect isn’t as dramatic, but I feel it calming down a little. Thanks for the continued posts. You are one of the few Canadian readers left. You are indeed a faithful reader. Very many thanks and I wish you well for the coming winter.